New Jersey Sen. Tom Kean, New Jersey Senate President Stephen Sweeney, Laura DePrado of Final Touch Plantscaping LLC, New Jersey Sen. Christopher (Kip) Bateman and Michael DePrado. 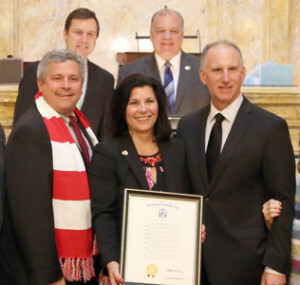 Photo courtesy of the New Jersey Senate. Assistant Agriculture Secretary Alfred Murray, Stat Sen. Christopher “Kip” Batemen, R-16; and Laura Deprado of Final Touch Plantscaping visit the Chesea at Warren. WARREN TWP. 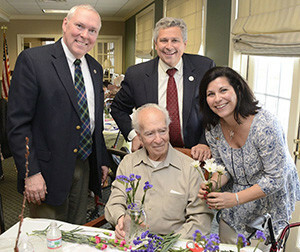 – State Sen. Christopher “Kip” Bateman, R-Somerset, and New Jersey Assistant Agriculture Secretary Alfred Murray visited the Chelsea at Warren assisted living residence, 274 King George Road, on Wednesday, March 16 to help launch Horticultural Therapy Week. The week is a statewide observance of the benefits of horticultural therapy for the overall health and well-being of people of all ages. Bateman was a co-sponsor of the enabling legislation which was signed into law in 2015 by Gov. Christie. The NJ Senate held Ceremonial for SJR12, designation third week of March as ​”​Horticultural Therapy Week​,” first in the nation. ​​Photo (Courtesy of NJ Senate) Left to right: Assemblyman Andrew Zwicker, Senator Michael Doherty, MaryAnne McMillan, HTR, Immediate Past President American Horticultural Therapy Association, Senator Anthony Bucco, Senator Tom Kean, Senate President Stephen Sweeney, Senator Kip Bateman​, Rotary Club of Branchburg, ​Laura DePrado, HTR, Final Touch Plantscaping, LLC., Rotary Club of Branchburg; Michael DePrado, Evelyn and Vincent Lipiniski,​ super seniors,​Dominick Mondi, Executive Director, New Jersey Nursery and Landscape Association, Senator Nick Scutari, Assemblyman Jack Ciattarelli, Senator Bob Smith, Frank Whittlesey. Horticultural Therapy Week is Sunday, March 20th to 26th. 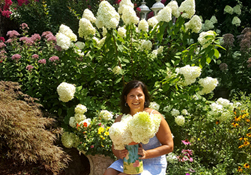 Just in time for Spring, the Garden State, designates third week of March as “Horticultural Therapy Week”, inaugurated in Ceremonial Senate Resolution on Monday March 14th. Gov. Chris Christie and New Jersey Legislature have declared March 20-26 and every year thereafter as ‘Horticultural Therapy Week’ to coincide with the beginning of spring. New Jersey is the first state in the nation to name March 20-26 Horticultural Therapy Week, coinciding with the start of spring. The designation is meant to showcase the benefits of connecting people and plants in vocational, social and therapeutic programs to improve the quality of life. Gov. Christie signed the legislation on May 11, 2015. Ceremonial on the Senate Floor for “Horticultural Therapy Week” Monday, March 14th, Statehouse, Trenton: (Courtesy of the NJ Senate). Left to right: Assemblyman Andrew Zwicker, Senator Michael Doherty, MaryAnne McMillan, HTR, Senator Anthony Bucco, Senator Tom Kean, Senate President Stephen Sweeney, Senator Kip Bateman, Laura DePrado, HTR, Final Touch Plantscaping, LLC., Michael DePrado, Evelyn and Vincent Lipiniski, Dominick Mondi, Executive Director, New Jersey Nursery and Landscape Association, Senator Nick Scutari, Assemblyman Jack Ciattarelli, Senator Bob Smith, Frank Whittlesey. Horticultural Therapy Week is Sunday, March 20th to 26th. Thank you to the NJ Legislature and Senator Kip Bateman for sponsoring SJR12, designation third week of March as Horticultural Therapy Week, mirroring the designation by Congress in Spring 2006. Let the designation in the Garden State be an example for other states to follow. 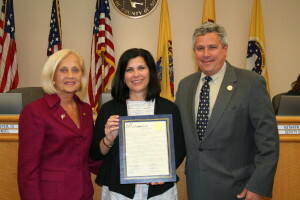 Honored to receive Proclamation from the Somerset County Freeholders for “Horticultural Therapy Week” March 20-26 from Director Patricia Walsh with Senator “Kip” Bateman. 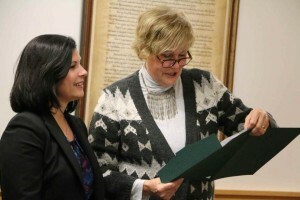 Senate Ceremonial will take place Monday, March 14th, inaugurating third week of March beginning this year, and every year thereafter as “Horticultural Therapy Week” in the Garden State to connect people and plants.